Since my last post I had a great crocheting period. I've been in a hat mood. First of all because I noticed that my Little Man's hat, a gift from his grand grand parents, was sliding over his eyes all the time he was outside, so it was obvious that he needed a new hat, the one that would fit. I've searched my stash, found some yarn and grabbed a crochet hook. In the first evening I had to remake it, starting all over again for about 5 times, but after all of that and one more evening the hat was finally finished. As you can see Little Man likes it. It has a big metal button on a side and fits perfectly. 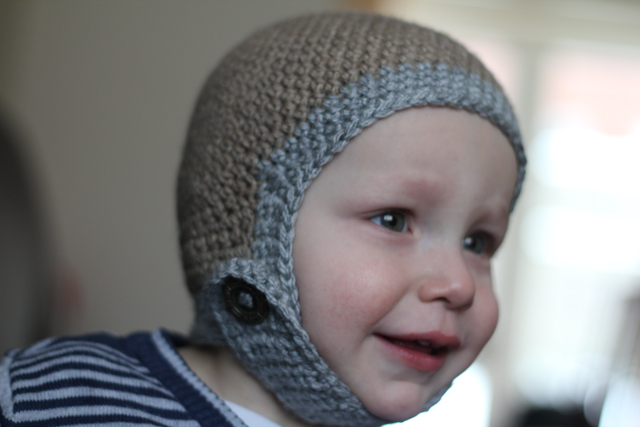 Every mum knows that babies are not big fans of hats and if they can pull that hat off, they will. Well, no chance with this one, Little Man was trying really hard but had to give up without even moving it away. Sadly I wasn't writing down the pattern while working on it. May be I will try to recreate it later as it might be useful for some other babies too. After finishing that hat I realized that my husband needs a hat too (it was snowing and freezing outside), so from the same yarn in the same evening I made a hat for him. 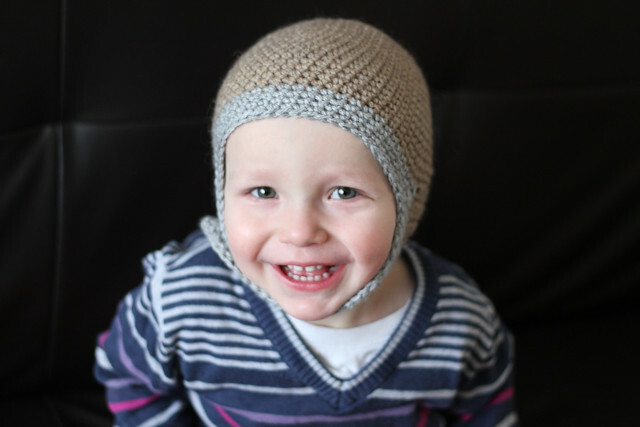 That one was so easy, that I will make a pattern for it and crochet one for myself. Sadly, no pictures of it this time. Then last Sunday I bought a knitting magazine and found an article about knitting for premature babies there. It was good to know that there are ladies here in England who knit tiny little clothes for premies and give them to the hospitals. While reading this article I felt that a big need for some charity work was growing in me. I wanted to help someone too. But I wasn't sure, that our hospital would take my knitting as I don't think they are dealing with premature babies. So I was thinking about orphanages. Went to the Internet and soon discovered that there are no orphanages in England. Makes me proud of this country again. And then I remembered that in 2011, when I was pregnant with Little Man I took part in a charity project for orphanages in Russia. I crocheted a blanket for them. Why not to make something like that again? I found one of the project coordinators in the Internet and started crocheting. 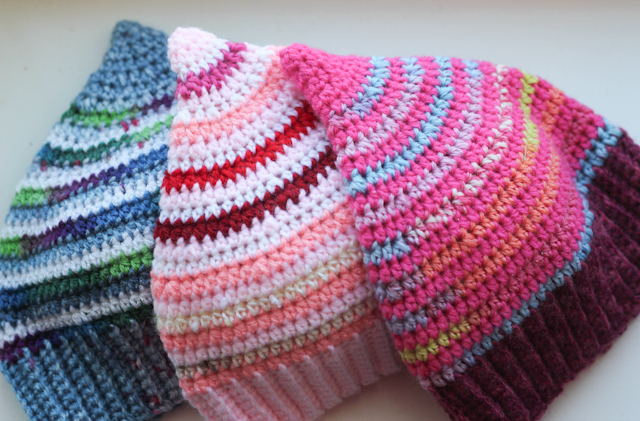 The pattern is A Scrap Buster hat from A Dog in a Sweater. When I saw this pattern for the first time I immediatelly wanted to make a hat like that but wasn't sure that I would wear it. It felt like something too childish, so perfect for babies, not for grown-ups. So when I decided to crochet for an orphanage it was a perfect chance to try the pattern out. What should I say about the pattern... It's easy. In fact it's super easy and written so good that it's easy to follow even for beginners. The only thing you really should think about before making them, except the size, of course, is the colour. The original hats looked a bit strange to me. No, they were fine, they just looked scrapy. And I wanted to make my hats funny, colourfull, but stylish in the same time. This are still scraps, but it doesn't feel like something that's made from unwanted leftovers. Now I'm working on two pairs of baby booties from my scraps too for the same orphanage. Will show them to you when they are ready. They look great! I have to confess... I really dislike that hat! I can't believe it became so popular! I think that people enjoy MAKING it, but probably not wearing it :P I really love what you did to it and I am going to link to this post to give people a neater option! Thanks for sharing and for what you are doing to give these little ones an extra smile or two! Wow, thanks, Jenna! 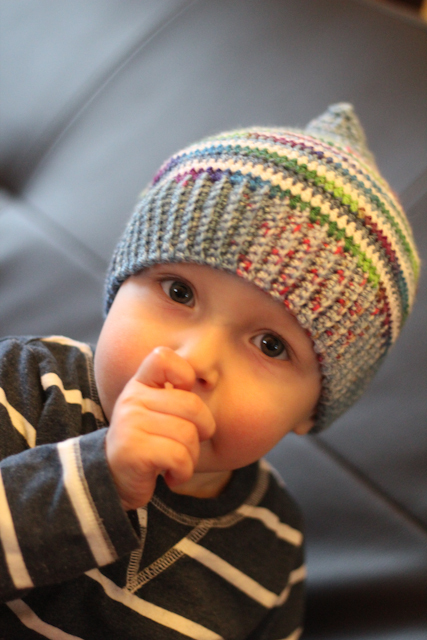 In fact, this hat pattern is graet as it's really easy and allows to use some different colours of yarn, so I think it's great for babies, especially if the colour choice is made good. I'm so glad you like my hats!